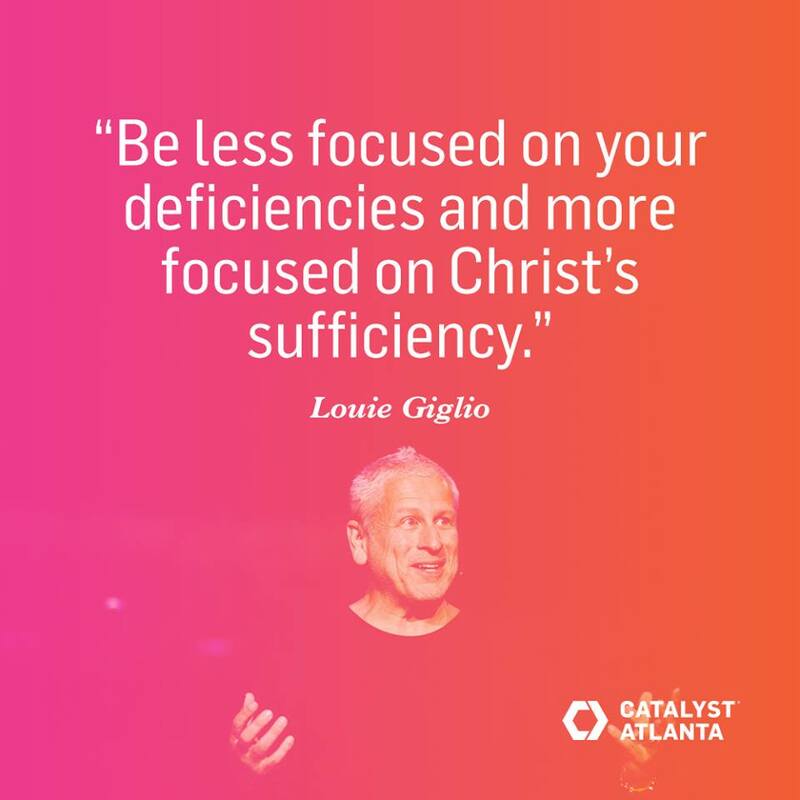 At Catalyst, Louie Gigilo gave a very powerful speech. We tend to live our lives by our own sufficiency, and that’s not God’s intention. 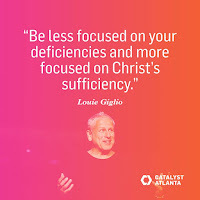 “*Focus on God’s sufficiency and less on your in-sufficiency. *Our culture is characterized by fear, anxiety, worry, doubt, depression and aided by things that were built up that does the sustaining. What we see sustains us. *You can’t live in the future if you are shut in the past of guilt and shame. Your past is forever. You are forgiven. *We are adopted children, fully, Holy and righteous. We aren’t looking for crumbs, we have the Bread of Life! *We should be transformed by God’s grace, not focused on my insufficiency but on God’s sufficiency. When we try to live life on our terms, or just in our own strength, we fail. God created us to want a relationship with Him. That emptiness that you feel or have felt before, He planned it to be filled with Him. One of my close friends gave his testimony at church last week. He used to be a drug addict. He told us how some bad things happened to him unexpectedly. Those things rocked his world, turned it upside down, and a void was created. He chose to numb his pain and fill that void with drugs for years. Not any more! God fills that void for him now. God is there loving him, healing him, and using him to tell others the truth. His friendship is a blessing to me. He tells others about God’s love and healing all the time. He tries to help them avoid making his mistakes, and show them how God heals. He is relying on God’s sufficiency, not his own. God doesn’t want us limping through life. Jesus came to give us life to the FULL! If you aren’t fully relying on God, His grace, His mercy, His love, and His provision, you are trying to live life alone. How’s that working out for ya? God loves you with an ever lasting love. He will never leave or abandon you. He will never reject you and turn away from you. He wants a relationship with you. He wants to be your Heavenly Father. Let Him transform you by His grace when you rely on His sufficiency, not your own.